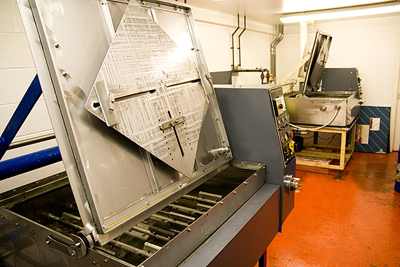 At Park Graphics we have over 50 years of experience in manufacturing hotfoil and embossing dies. The thickness of metals we produce varies – supplying the following plates: 16 gauge (1.63mm), 8 gauge (4mm), 5 gauge (5mm) and 3 gauge (6.35mm) in magnesium. Deep etched plates are available on request. We pride ourselves in offering a quality driven, friendly service in which are able to provide a fast turnaround for most jobs. Currently we are working to a 2pm cut off time for jobs being dispatched same day. Please note that we are also suppliers of polymer plates. We have an in house design studio which can provide artwork for your specific requirements using the very latest software available. If you require further information, or a quote, please feel free to contact our friendly staff who are more than happy to answer any questions you may have.